As finales go, it won’t rival the final episode of M*A*S*H for number of viewers, but the final episode of Mountain Sports Report meant a whole lot to those of us who were fortunate enough to participate in it. The No. 3 seeded San Diego State Aztecs upset the No. 2 seed TCU Horned Frogs in an elimination game Saturday at the 2012 Mountain West Baseball Championship, 12-11. The 2012 Mountain West Baseball Championship's No. 1 seeded New Mexico picked up a come-from-behind 5-2 victory over No. 2 seed TCU on Friday night at Earl E. Wilson Stadium. No. 3 seed San Diego State defeated No. 4 seed UNLV Friday night at the 2012 Mountain West Baseball Championship, 15-9. No. 1 seed New Mexico topped tournament host and No. 4 seed UNLV Thursday night , 13-0, in the second game of the 2012 Mountain West Baseball Championship. Brett Johnson's looping single over the drawn-in infield capped a wild ninth inning and gave TCU a 16-15 win over San Diego State in the opening game of the MW Tournament. Often times, you don’t know what you’ve got until it’s gone. Make no mistake. The Mtn. will be missed. The Mtn. – MountainWest Sports Network begins live coverage from Las Vegas, Nev. of every game of the 2012 Mountain West Baseball Championship beginning Thursday, May 24. New Mexico (18-6, 33-22) and TCU (18-6, 35-17) shared the 2012 Mountain West regular season baseball title and enter the MW Baseball Championship as the No. 1 and No. 2 seeds, respectively. Preston Morrison tossed a complete-game one-hitter, while Kyle Von Tungeln had a career-high four hits to lead No. 20 TCU to a 4-0 victory over San Diego State Saturday afternoon at Lupton Stadium. San Diego State pushed across three first-inning runs and rode them to a 3-0 win over TCU Friday night at Lupton Stadium. The Mtn. 's very own Brett Brown brings you the latest news and events happening across the conference in today's MountainWest Minute. The Air Force men and TCU women both emerged victorious from the 2012 Mountain West Outdoor Track & Field Championships, held at the Cadet Outdoor Track & Field Complex in Colorado Springs, Colo. Sitting with a 4-2 lead entering the bottom of the sixth inning, things looked oh-so-good for the New Mexico Lobos. The UNLV baseball team picked up a dramatic, come-from-behind victory Sunday afternoon, topping San Diego State 5-4 at Tony Gwynn Stadium. Kevin Cron broke a scoreless game with a two-run double in the seventh inning and TCU held on for a 2-1 series-clinching win over New Mexico. San Diego State spotted visiting UNLV a run in the first inning and then scored nine times from the second through fifth en route to a 9-2 win over the Rebels Saturday night. The University of New Mexico baseball team split a double header Saturday against TCU. The San Diego State softball team gave up four runs in the top of the sixth inning in a 4-3 loss to Boise State Saturday afternoon at SDSU Softball Stadium. A Friday night rain storm postponed game one and upon resumption on Saturday, TCU put up four runs in the first and rode it to a 5-3 victory over New Mexico. The UNLV baseball team suffered a 10-7 setback in a Mountain West game to San Diego State Friday night at Tony Gwynn Stadium. The Mountain West announced today that San José State University and Utah State University have accepted invitations to join the Conference, effective with the 2013-14 academic year. UC Irvine scored five runs over the first three innings and went on to defeat San Diego State, 6-2, Tuesday evening at Tony Gwynn Stadium. Two Oklahoma errors in the ninth inning proved costly as Derek Odell singled with two outs to send TCU to a 4-3 walk-off victory. Top-seeded and No. 32 TCU captured the 2012 Mountain West Women's Tennis Championship title after it defeated third-seeded San Diego State, 4-2, Sunday afternoon at Aztec Tennis Center. Top-seeded and No. 38 Boise State defeated No. 66 and third-seeded New Mexico, 4-0, to claim the 2012 Mountain West Men's Tennis Championship Sunday at Aztec Tennis Center. The third-seeded San Diego State women's tennis team advanced to the championship match of the 2012 Mountain West Women's Tennis Championship with a 4-1 win over second-seeded and 48th-ranked UNLV. The top-seeded and 32nd-ranked TCU women's tennis team advanced to the finals of the Mountain West Women's Tennis Championship with a 4-0 win over No. 4 seed and 62nd-ranked Wyoming Saturday at Aztec Tennis Center. The top-seeded and 38th-ranked Boise State men's tennis team defeated fourth-seeded TCU, 4-0, on Saturday afternoon at Aztec Tennis Center to advance to the Mountain West Men's Tournament championship match. Former Boise State defensive end Tyrone Crawford was selected in the third round of the National Football League Draft Friday, going to the Dallas Cowboys at No. 81 overall. San Diego State running back Ronnie Hillman was selected in the third round of the National Football League Draft on Friday afternoon by the Denver Broncos. Facundo Lugones earned the fourth point at No. 2 singles as fourth-seeded TCU defeated fifth-seeded UNLV, 4-1, in the quarterfinals of the 2012 Mountain West Men's Tennis Championship. No. 66 and third-seeded New Mexico defeated sixth-seeded Air Force, 4-0, in the quarterfinal round of the 2012 Mountain West Men's Tennis Championship Friday at Aztec Tennis Center. Second-seeded and No. 48 UNLV secured a spot in the semifinal round of the 2012 Mountain West Women's Tennis Championship after it defeated seventh-seeded Colorado State, 4-0, Thursday afternoon at Aztec Tennis Center. Third-seeded San Diego State earned a 4-0 win over sixth-seeded New Mexico on Thursday at Aztec Tennis Center. Fourth-seeded and No. 62 Wyoming defeated fifth-seeded Air Force, 4-0, in the quarterfinal round of the 2012 Mountain West Women's Tennis Championship Thursday at Aztec Tennis Center. Colorado State University today announced that Kristen Holt has reached mutually agreeable terms with the University to resign her responsibilities as Women's Head Basketball Coach. Wyoming Athletics Director Tom Burman announced on Wednesday that Dean Clower has been promoted to head coach of the Wyoming Cowgirl tennis program. No. 9 Texas A&M rallied with four runs in the last two innings to steal a 4-1 victory over TCU Tuesday night. Brett Brown wraps up the latest information and talk around the conference in today's MountainWest Minute. The Mountain West announced its 2011-12 Women's Golf All-Conference team awards at the conclusion of its championship today at the Wigwam Resort in Litchfield Park, Ariz.
TCU secured its second consecutive Mountain West Women's Golf Championship on Sunday at Wigwam Resort in Litchfield Park, Ariz.
Another solid pitching performance and timely hits helped TCU to its ninth straight win. San Diego State led from start to finish as it captured the finale of its three-game series with TCU by the score of 5-3 Sunday afternoon at Tony Gwynn Stadium. Mountain West regular-season champion and 31st-ranked Boise State (24-6 overall) enters the 2012 Mountain West Men's Tennis Championship as the top seed after posting a perfect 5-0 mark in Conference play this season. The University of New Mexico softball team dropped its fifth game in a row to Mountain West conference foe San Diego State, 12-6, on Saturday at Lobo Field. Defending champion TCU maintained its lead after 36 holes of the 2012 Mountain West Women's Golf Championship on the Gold Course at the Wigwam Resort in Litchfield Park, Ariz.
Brett Brown brings you the latest talk from around the conference in today's MountainWest Minute. The TCU Horned Frogs stretched their winning streak to eight straight with a 6-1 win over San Diego State Friday night. Jason Coats spurred the offense with three hits and two RBIs in his return to the lineup. The Mtn. will air three live Mountain West Conference softball games in 2012 beginning Saturday, April 21 when New Mexico hosts San Diego State at 3 p.m. MT. The TCU Horned Frogs used an offensive onslaught to stretch their winning streak to seven games as they defeated ULM, 9-2, Tuesday night. Brett Brown brings you all the latest news and commentary from the conference in today's MountainWest Minute. The University of New Mexico baseball team dropped its eighth one-run game of the season, falling to the San Diego State Aztecs 4-3 on Sunday afternoon in heartbreaking fashion. The University of New Mexico Lobos swept both games of a doubleheader against conference rivals San Diego State by the scores of 5-1 and 11-4 on Saturday afternoon. Green is Universal, and The Mtn. is celebrating Earth Week! From April 15 - 22 we will incorporate special programming and features to promote sustainability, environmental awareness and education. Now in his fifth year as the head baseball coach of the New Mexico Lobos, Birmingham sees more than just the playing field. He sees everything leading up to games, and everything that’s important afterwards. Brett Brown brings you all the latest news and commentary in today's MountainWest Minute. Long Beach State broke open a 2-2 game with seven runs over the seventh and eighth innings as it defeated San Diego State, 9-4, Tuesday evening at Tony Gwynn Stadium. TCU director of intercollegiate athletics Chris Del Conte has announced the hiring of Trent Johnson as head men's basketball coach. Imagine if Steve Nash was American (he’s not, he’s Canadian.) It’s 2007 and USA Basketball is compiling a list of 25 or so American basketball players to invite to try out for the 2008 USA Olympic Basketball team. San Diego State saw an early 2-0 lead go by the wayside as the University of San Diego struck for five runs over the middle three frames en route to a 6-2 win over the Aztecs Monday evening at Tony Gwynn Stadium. Many moons ago I found myself in the right place at the right time. I was going to be part of the Milwaukee Brewers starting rotation... read more. Brett Brown wraps up the latest news and events from the Mountain West Conference in today's MW Minute. Cal State Fullerton took advantage of several Aztec miscues to score some early runs and went on to claim a 7-1 victory over San Diego state Tuesday night at Tony Gwynn Stadium. The TCU Horned Frogs fell into a 4-0 hole to Dallas Baptist and rallied back to within one, 4-3, but couldn't complete the comeback Tuesday night. Ohio University Director of Athletics Jim Schaus has named Jim Christian as the Bobcats' men's basketball head coach at a news conference on Tuesday. TCU head coach Jim Christian will replace John Groce at Ohio University. The UNLV Rebels avoided the sweep with an 11-0 victory over TCU Sunday afternoon at Lupton Stadium. The TCU Horned Frogs played smallball to eke out a 2-1 win over UNLV Saturday afternoon. The TCU Horned Frogs used a three-run fourth inning to earn a 4-2 win over UNLV Friday night at Lupton Stadium. Brett Brown brings you all the latest Mountain West Conference news and commentary in today's MW Minute. Colorado State athletic director Jack Graham announced Friday night that Miles had resigned so he could take the job with the Cornhuskers. 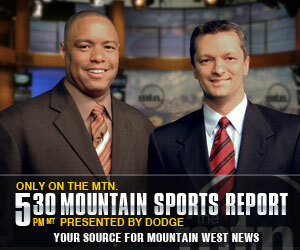 Brett Brown wraps up the week with the latest news and developments in the Mountain West Conference. Brett Brown brings you all the latest Mountain West Conference news and commentary in today's MountainWest Minute. Brett Brown recaps the postseason basketball action from the Mountain West teams, and interviews Alvester Alexander in today's MW Minute. Redshirt junior forward Leonard Washington scored 14 points and senior center Adam Waddell added 13, but the University of Wyoming men's basketball team dropped a 61-41 game at Washington State on Monday night. Junior guard/forward Garlon Green led the Horned Frogs with 21 points, but Oregon State posted a blistering offensive performance while handing TCU a 101-81 loss Monday in the quarterfinal round. The 12th-seeded San Diego State women's basketball team led by seven points four times in the second half... as host and fifth-seeded LSU rallied to claim a 64-56 victory Sunday at the Maravich Center. Russ Smith had 17 points as Louisville held off New Mexico 59-56 Saturday night for its sixth consecutive win to advance to the regional semifinals for the first time since 2009. Richard Howell doubled his average with 22 points and 11th-seeded North Carolina State used its muscle inside and sticky defense to upset San Diego State 79-65 on Friday in a first-round East Regional game. The UNLV Lady Rebels (22-10) suffered a season-ending, 71-63 loss to the Saint Mary's Gaels (22-10) in the first round of the Women's National Invitation Tournament. Freshman reserve Askia Booker scored 16 points Thursday night and 11th-seeded Colorado held off a furious UNLV rally for a 68-64 victory in the South Regional. Kendall Williams scored 14 of his 16 points in the second half and bottled up Long Beach State star Casper Ware defensively to help fifth-seeded New Mexico hold on for a 75-68 victory in the West Regional on Thursday. Isaiah Canaan scored 15 points in Murray State's return to the NCAA tournament after a two-year wait, and Donte Poole added 13 to lead the Racers to a 58-41 victory over Colorado State. Six Horned Frogs scored in double figures and TCU never trailed Tuesday during an 83-73 victory over Milwaukee in the first round of the College Basketball Invitational presented by Zebra Penn. Jen Klein has resigned as head women's soccer coach at UNLV to take a position on the Washington State coaching staff, the UNLV athletic department announced. The TCU Horned Frogs stretched their winning streak to five straight games with a 7-4 come-from-behind victory over Texas Tech on Monday afternoon. The Mountain West will send two women's basketball teams to national postseason tournaments - Aztecs earn automatic bid to NCAA Tournament; Lady Rebels to WNIT. Two Mountain West teams will participate in the 2012 College Basketball Invitational (CBI) presented by Zebra Pen, the organization announced Sunday evening. A league record-tying four Mountain West teams will participate in the 2012 NCAA Men's Basketball Championship with Sunday's bracket announcement.